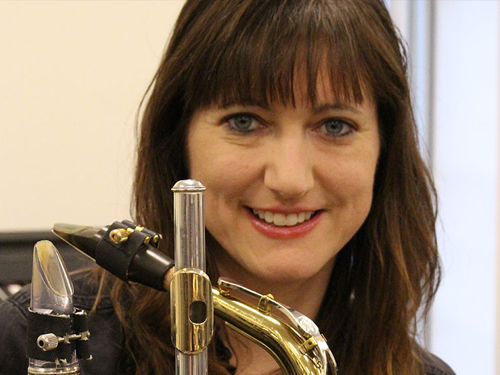 Beth has taught at Music Land since July 2006 and has performed all styles of music on all woodwinds with flute being her main concentration. Beth began her career in music in the Harford County Public School music program and continued her studies at Harford Community College and Towson University. She has earned a Bachelor’s Degree in Music Performance and Education from the University of Maryland Baltimore County and a Master of Music Degree in Flute Performance from the University of Delaware. She has studied with Dolly Reinhardt, Sara Nichols, Glenn Cashman, Lisa Cella, and Eileen Grycky. Beth is a recipient of the William Humbert Memorial Scholarship and Veile Scholarship as a Towson student. She has 23 years of combined classroom and studio teaching experience. She is a certified music educator in both the state of Maryland and Delaware. Beth has adjudicated various instrumental competitions for CCPS and the MBDA as well as assisting in directing all-county band rehearsals in Sussex County, Delaware. Currently she is employed as a Band and Choral director for the Delmar School District, Delmar, DE. She is also an employee of Music Land, assisting during the summer months when she is not in a classroom. Beth has played with the Bel Air Community Band, Towson University Flute Ensemble, Wind Quintet, Orchestra, Symphonic Band and Jazz Ensemble as an undergraduate. She performed with Early Music Ensemble at UMBC and Chamber Orchestra and Orchestra at Delaware University. Beth continues to perform in church services, jazz ensembles, and rock bands in the Baltimore area. She is a member of the Hank Levy Legacy Band, originating from Towson University.